I have spent the last week gamifying my 5th grade. I developed my theme, posted everything up and so forth. Then I came upon the "Hall of Honor", which is basically the leader board for my game. I had previously created a leaderboard for my blogs (see Gamification, starting really small), but this time, I wanted the sheet to automatically assign all badges (images) in response to inputting the XP scores. I knew that I could just use something like Edmodo to keep track, but that meant that I would have to create a bunch of small groups and assign the badges manually. As much as I love Edmodo, this seemed like a hassle, and I could just see myself forgetting or clicking one student instead of another. I turned to my trusty internet in search of something already made, and although there were several sites that came up (Badgeville and Leaderboarded, for example), they did not meet my most basic need - "FREE". So, with a very rudimentary understanding of Google Spreadsheets and the help of Youtube tutorials, I developed my own. The spreadsheet has one dedicated page for the leader board and then 9 others for the different units. I could not figure out how to use just one formula for text and images AND that responded to the value of an imported range, all at the same time, so I solved the problem by populating an extra set of columns using import range (not shown to students) just with the values and then used =IF(M2>=100;image("http://goo.gl/f8Gjbj"); IF(M2<=99;"Locked";)) to display either the image or the word locked on the Unit cells. This made the look quite cluttered, so I went with white text on those cells. My end result, a sheet that responds to and assigns badges automatically as soon as I update the individual values for a student. Since all is tied together, I can also sort the columns any which way I need without worrying about "messing up" someone's badges or XP points. Just be aware that changes are not instantaneous; it sometimes takes a little while to load and update everything. If you would like to view the full spreadsheet, and perhaps make a copy to modify to fit your needs, click on the image. I will still need to input the individual XP for the assignments myself, but I have saved myself from the tallying and badge awarding. I also think that if I'm careful about naming conventions with the students, I might just be able to automate the input of XP directly from Flubaroo graded assignments, or from Google Form assignments. Now wouldn't that be a dream? If you find this useful, or if you have found other ways to do this, leave a comment. I know that I will be grateful. Beyond "I really liked this project"
"Within the word we find two dimensions, reflection and action, in such radical interaction that if one is sacrificed -- even in part -- the other immediately suffers . . ."
If I am to promote changes in my students' thinking and growth, I need to improve their ability to reflect. So, last summer I read everything I could on the subject and promptly set about attempting to create a classroom where reflection was a big part of our daily and weekly activities, as well as a final requirement for our projects. I made a cutesy chart that was prominently displayed and used. I made weekly reflective blog posts a requirement, and at the end of every project assigned a reflection, which was graded on a rubric. "Describe what you learned in completing the assignment, identify what went well and detail what you will improve on for next time." "I really liked this project/assignment because I got to work with my friends..."
"Next time, I will stay on task more and not get distracted." Recently, I came across Edutopia's 40 reflective questions, and I particularly liked how they separated them into categories (Backward-looking, Inward-looking, Outward-looking, Forward-looking). I think that by naming them, the respondent gets into a different mindset as he/she prepares to answer. As I move forward, I will be modifying them a little bit to address not only the end products, but the weekly work. 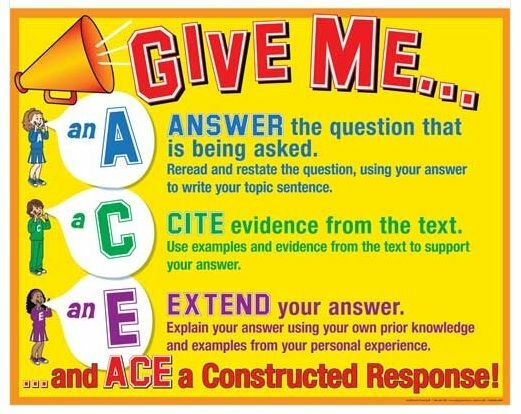 I will also ask students to "ACE" their answers, citing examples and non examples, as well as expanding with a "what it looks like or sounds like". Of course, there will be a rubric. Will it work? I don't know, but I would love to hear your thoughts. 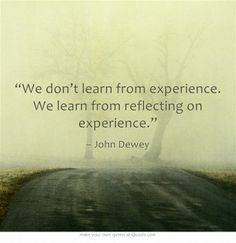 How have you improved student reflection in your classroom? Block, Joshua. "Let It Marinate: The Importance of Reflection and Closing."Edutopia. Edutopia, 18 Apr. 2014. Web. 13 June 2014. <http://www.edutopia.org/blog/let-it-marinate-reflection-closing-joshua-block>. Boss, Suzie. "High Tech Reflection Strategies Make Learning Stick." Edutopia. Edutopia, 4 Mar. 2009. Web. 13 June 2014. <http://www.edutopia.org/student-reflection-blogs-journals-technology>. Yoshida, Clyde. "Creating a Culture of Student Reflection: Self-Assessment Yields Positive Results." Edutopia. Edutopia, 1 July 1997. Web. 13 June 2014. <http://www.edutopia.org/creating-culture-student-reflection>. Clements, Mark. 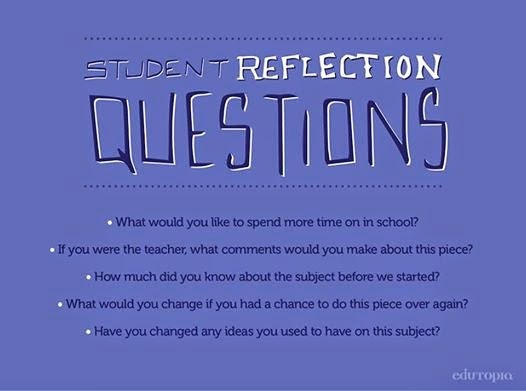 "Using Reflection to Help Students Learn." Edunators. N.p., n.d. Web. 13 June 2014. <http://www.edunators.com/index.php/becoming-the-edunator/step-5-reflecting-for-learning/using-reflection-to-help-students-learn>. I started toying with the idea of having my students create e-portfolios about a year ago. At the time, I found a lot of information and examples for their use in professional settings and higher education levels. Fortuitously, I stumbled upon Helen Barrett's "EPortfolios with GoogleApps", and since I already had my students blogging weekly, and set up my class to turn in mostly digital work, I figured that I just might take the last step. I wanted to give my students an opportunity to reflect on a year's worth of hard work, and be able to share their accomplishments. In other words, I wanted their learning to become visible outside our walls. "Showcase the work already done and provide a space for my students to reflect on their experience at our school." Finally, about two months before the end of school, I gave out the assignment (E-portfolio assignment). Although I did include a rubric, I purposely did not assign points to each level, nor did I tell them that I would not be adding the e-portfolio as a graded assignment. I just stated the due date and left it at that. There was no class time allocated to developing the portfolios, but when some of them asked for help I offered after-school workshops - to my surprise these quickly became standing-room only. I asked myself, and eventually some of my students: "Why would an 8th grader give up their social time to come in and work on an ungraded assignment?" Their answer speaks to Pink's "Drive" - "Because I have a choice in all aspects of this assignment, and I don't have to worry about a grade.I'm doing this for me." This is not to say that all my students completed their portfolios (about 25 out of my 140 didn't), but those that did turned in amazing pieces. Since I loop students for 4 years (5th through 8th), I know I will need to come up with some strategy to ensure that everyone completes the assignment next year. Also, by their very nature, the portfolios are living documents, so I will need to make sure that the students that did complete them this year avoid overwriting their work (I guess extra tabs will be in order, although I'm sure my students will come up with something more interesting). I developed a deeper understanding of my students. As I read through their responses "What it means to be an AdVENTURE student", I cried, laughed and sometimes cringed. The truth is that they revealed themselves and their truths deeply. Their selections of artifacts and reflections also helped me view students in a new light. Their reflections on the samples of their "best work" were often poignant and included ideas and specifics I would not even think about. I also got to see what was important to them in a piece of work. Students took pride and responsibility for their work. I witnessed students sharing their portfolios with their other teachers, and conversing with each other about what they were including and why. I had parents thanking me for the assignment, which had opened up dinner conversations about school and their students accomplishments throughout the year. If nothing else, this strengthens my conviction in making the e-portfolio a standing assignment. Some of my students did not have pictures or had misplaced non-digital work that they wanted to include in their portfolios. Knowing that, next year I will introduce the e-portfolio early on. I will also encourage the use of their blogs and Google drives as storage not only for work created digitally, but for electronic images of models, paper based assignments, etc. Modify the weekly blog assignment to include a more solid reflective piece in order to help students develop a deeper narrative. Have you used e-portfolios in your class? If you are, or if you are even thinking about it, I would love to hear from you. Hartman, Elyse. "Free Ed Tech Resources (100+ Pages!) EBook." Emerging Education Technology RSS. Emerging Ed-Tech, 24 Mar. 2013. Web. 8 June 2014. <http://www.emergingedtech.com/2013/03/are-eportfolios-still-relevant-for-todays-students/>. Barrett, Helen. "EPortfolios with GoogleApps." EPortfolios with GoogleApps. N.p., n.d. Web. 08 June 2014. <https://sites.google.com/site/eportfolioapps/Home>. "Catalyst for Learning." Catalyst for Learning. The Making Connections National Resource Center, n.d. Web. 08 June 2014. <http://c2l.mcnrc.org/>. If you landed here, you might consider reading what I wrote for my students on "Why the blogs are important..."
This year, all of my students (grades 5 through 8) were tasked to create and maintain a blog, where they reflected on the learning that had taken place from week to week. At first, everyone was excited about the prospect, and they created their blogs with gusto, adding all sorts of sounds and mini-games to them. However, the novelty wore off rather quickly, and even though the blogs comprised 30% of their grade (graded using a rubric), some students started to invent excuses for turning them in late and/or plain not doing them. Right around that time I came across Annette Vee's post "How to teach with blogs" and the external motivation point she makes resonated with me. That prompted me to attempt to gamify the experience (Gamification starting really small), and also to give the opportunity of writing "Option 2 blogs". I also started accepting paper blogs and videoblogs. Although this sounds a little bit like a management nightmare, it actually turned out so well that I am definitely doing it again. I will, however, modify the assignment a little bit. My students became pretty good at writing about the content, but the reflective piece did not improve much as the year progressed. I am currently developing a more explicit assignment that should take care of this issue, borrowing the reflection question set from Edutopia . Students who blogged consistently saw a marked improvement in their writing ability. One particular student of mine comes to mind. This student lives with dysgraphia, and at first I had all sorts of accommodations for his blogs (the videoblog option was developed with him in mind). It took lots of perseverance and determination on his part, but by the end of this school year, he is able to produce weekly typed, coherent blogs, with minimal errors, graded without differentiation. His ELA score soared, and he is more engaged in school. Blogging students saw an increase in their understanding of the material, and through the conversations that ensued because of the blogs, I was able to cover the material more in depth. Student blogs also helped me become aware of misconceptions and plain errors in what they were thinking or understanding. Because of the blogs, these misconceptions and errors were addressed in a more timely manner. Blogging gave my reluctant participants a voice and status as someone with something to share. I am reminded of another student, who I would seldom hear in class discussions. However, his blogs showed not only that he had understood the content, but showed his peers that his ideas were relevant and important. As the year progressed, he was one of the first students to obtain the rank of "Supreme Blogging Grand Master", and the pride he took in his blog and this accomplishment cannot be understated. If I am to be honest, there were several times throughout the year where I disliked the blogs. Sitting every week to rubric grade and give pointed feedback on 140 blogs each week is tiresome. Even with the gamification and choice aspects, about 10/140 students across grade levels just did not blog with any consistency, or turned them in with little effort. In trying to solve this I began awarding blog immunity (top 5 scores from all classes), and tying blog XP to access to group projects (for example, in order to participate in the Eco-house group project you must have at least 100 blog XP, otherwise you are working on the individual sustainability project). I implemented this at the very end of the school year, so it was a little late to see major changes. As this becomes part of the routine, I hope that this increased external motivation will yield results. So, what do you think? I would love to hear from other teachers that have implemented blogs; how did they impact your students and your practice? "Edublogs Teacher Challenges." Edublogs Teacher Challenges. Edublogs, n.d. Web. 08 June 2014. <http://teacherchallenge.edublogs.org/blogging-with-students/>. Couros, George. "5 Reasons Your Students Should Blog." Connected Principals. Connected Principals, 20 Mar. 2013. Web. 08 June 2014. <http://connectedprincipals.com/archives/8007>. Lampinen, Michelle. "Blogging in the 21st-Century Classroom." Edutopia. Edutopia, 8 Apr. 2013. Web. 08 June 2014. <http://www.edutopia.org/blog/blogging-in-21st-century-classroom-michelle-lampinen>.